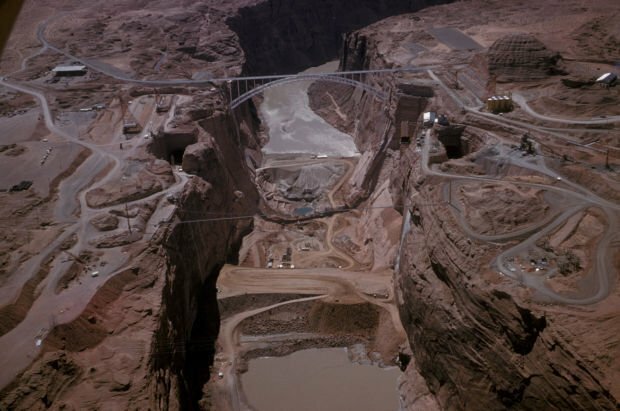 Glen Canyon Dam, under construction in the early 1960s, is viewed from north to south. Photo courtesy Mike Woods. Glen Canyon Dam, under construction in the early 1960s. Photo courtesy Dana Stone. 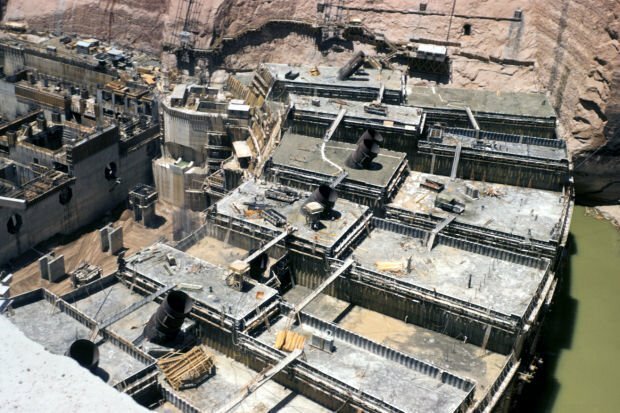 Glen Canyon Dam, under construction in the early 1960s. A steel arch bridge is being assembled above Glen Canyon in the late 1950s. Photo courtesy Mike Woods. PAGE – The nation’s second-highest concrete arch dam is throwing a party Saturday, and everyone is invited. Glen Canyon Dam, the 710-foot-high icon just below Page, will call attention to its 50th anniversary with a series of speeches, commemorative displays and music from noon to 4 p.m.
Hydroelectricity was first produced from the facility Sept. 4, 1964, eight years after the first blasts began setting up the foundation. In the dam and power plant’s first 19 years, it generated nearly $500 million in electrical sales, or more than double the cost of construction. From 1960-63, more than 5 million cubic yards of concrete was poured, equal to the volume of material for a four-lane highway from Phoenix to Chicago. The dam was established to help meet the power and water needs of cities, industries and agriculture throughout the West. Its 26.2 million-acre-feet of storage capacity serves as a water bank for a region of the nation that tends toward drought. The six states that primarily benefit from dam electricity more than tripled in population from 1960 to 2010, while the U.S. grew by a more modest 71 percent. Arizona exploded from 1.3 million to 6.3 million residents during the span. Power customers number about 5.8 million. Anticipated featured speakers for Saturday’s event at the crest of the dam are Sally Jewell, Secretary of the Interior, Anne Castle, assistant secretary for water and science, Page Mayor Bill Diak and state House Speaker Andy Tobin, who is running against incumbent Ann Kirkpatrick in Congressional District 1. Also expected to address the gathering are guest speakers from water and power partners, elected officials and community members. The commemoration comes at a critical time for the dam workers’ alumni. At its peak, the workforce boasted of nearly 2,500 people, but the passage of time is thinning the ranks. Seventeen people gave their lives during 10 years of construction. President Eisenhower flipped a switch to effectively set off the first explosions at Glen Canyon in October 1956. Three years later, a 1,271-foot-long steel arch bridge was hauled to the site from California in parts and assembled. The last of 400,000 concrete pours was made in September 1963, and a year later, the first electricity was issued from the dam into a regional electrical grid through a pair of long-distance transmission lines. Power went as far as Phoenix and Farmington, N.M. The dam was dedicated in September 1966 by Lady Bird Johnson. Today, hydro power from Glen Canyon is marketed by the Western Area Power Administration to municipalities, rural electrical cooperatives, Native American tribes and governmental agencies through parts of Arizona, Nevada, Wyoming, Colorado, New Mexico and Utah, and as far as Nebraska. The dam gave birth to Page, established in 1957 atop nearby Manson Mesa. Page receives its water supply from the dam. But the community of about 7,200 is now more synonymous with Lake Powell, also a product of the dam. The facility is a key feature of the Colorado River Storage Project, based on the 1922 Colorado River Compact that mandated improved water distribution in periods of drought in the Upper Colorado River Basin states. The first major project along the Colorado was 726-foot-high Hoover Dam, finished in 1936. Saturday’s displays are expected to demonstrate differences from the early 1960s to today. Glen Canyon’s high-scaling team will show old and new equipment, Glen Canyon Recreation Area will show recreation then and now, dam engineers will show protective equipment from both periods, and dam electricians will showcase test equipment. The Powell Museum will display historic photographs and artifacts. Other participants will be Friends of Lake Powell, with a quagga mussel display; Navajo Generating Station; WAPA, with its helicopter; Banner Page Health, along with the local chamber of commerce. Water conservation information also will be available. Entertainment is expected to feature Navajo dancers and the third generation of a band that once played for square dancers on top of the dam in its early days. Um, hate to sound like a booby, but aren't we forgetting a few things? Like, say, the flooding of the beautiful Glen Canyon? The destruction of habitat? The inundating of archaeological sites? And what about the other damage, like the silt that has accumulated in Lake Powell? Or the bathtub rings in the canyon? Or the unnatural flows of water in Grand Canyon that have changed the nature of life both in the water and on the shores? The Dam is a mixed bag at best, and not a cause for celebration.